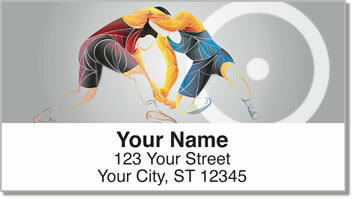 Take down the tedious task of preparing your outgoing mail and pin one of these sports-themed address labels to every envelope! This eye-catching selection features illustrations of amateur wrestlers in action. Opponents battle for the advantage as they grapple and fight until someone finally wins. 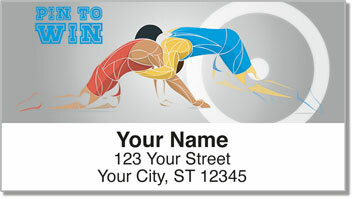 Two competitors become knotted together in a struggle of determination and pure athleticism. 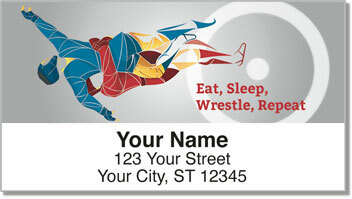 Celebrate the sport of wrestling with these return address labels. They are self-adhesive, so you'll never have to scribble your name and address on another envelope ever again. 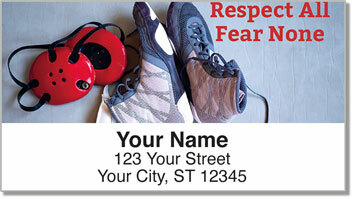 Get your very own Wrestling Address Labels today! You can also order matching checks and a custom checkbook cover in leather or cloth.